The old saying goes that history repeats itself – and in the case of American politics, it’s definitely true. Every four years Americans receive the equivalent of a full-scale sell job by presidential candidates of both parties looking to woo the hearts and minds of voters -- or at least those in the ten to twenty percent of “independent” folks who occupy the political center, the ones who are still supposedly persuadable and decide every election. Needless to say a whole lot of promises are made during those campaigns. Many of them concern the first “100 days” of each new president’s first term, a time when hopes are highest for real change in Washington. But while everyone, including the staunchest partisans attending mass rallies, understands that political promises are worth about as much as the weight of the air used to articulate them, there are certain expectations that go along with a changing of the White House guard. Many in the media are claiming Donald Trump hasn’t lived up to his campaign promises, especially since he’s “failed” to achieve a signature legislative accomplishment in his first 100 days. But did anyone truly expect him to? Byron York of the Washington Examiner writes, "On the legislative front, while Trump has been part of a successful Republican effort to turn back parts of the Obama legacy, the president has failed to pass an Obamacare repeal and replace bill, failed to pass tax reform, and for that matter failed to pass any other significant piece of legislation. If Trump wanted to have a signature legislative achievement in his pocket by the 100 day mark, he certainly didn't act like it. Too true. Some presidents get a lot of things “done” and it ends up wrecking the country. Look at Obama, a politician who promised to heal all the nation’s economic wounds but instead ended up doubling the size of the national debt with practically zero fiscal benefits to show for it. In his excellent article York explains that Trump has followed through on a good many of the executive actions he outlined in his “Contract with the American Voter” last fall, most notably the successful appointment and confirmation of Justice Neil Gorsuch to the Supreme Court and the stepped-up immigration enforcement and deportation of criminal aliens. York even titled the item “Trump's 100 days: An executive success,” which separates it from the morass of “failure” reporting being advanced by most major media outlets that only seem concerned with chits on a hypothetical scorecard. Trump’s first 100 days can probably be boiled down to one simple conclusion: the promises he could act on through unilateral executive orders, he kept almost down to the letter; but those things that required the slow-moving Congress to cooperate, not so much. None of this is Trump’s fault directly. Unlike Newt Gingrich’s “Contract with America” in 1994, these items are not single vote issues that can be accomplished with a simple yes or no in Congress. Using the examples from the last paragraph, energy and infrastructure policy, education and childcare/eldercare are extremely complex issues that will require a great deal of time and compromise to hammer out. That’s not to mention a willing Congress must be included in the equation. Trump may have been elected with a mandate from the voters but that doesn’t guarantee the Washington establishment will just roll over and give him everything he asks for. Similarly, congressional conservatives will probably object to some of Trump’s more grandiose spending proposals. Some conservative queasiness was already seen in the healthcare debate. And then there are the interest groups. Taking education for example, the same forces that so vigorously opposed the confirmation of Education Secretary Betsy DeVos will be there every step of the way furiously objecting to any meaningful reform in federal education policy. This is one area where liberals find “choice” is a dirty word. Words like “innovation,” “accountability” and “achievement” are scary to liberals because they imply some sort of standard must be applied to measure something. Even more so, liberals fear “competition” and “choice” in education because they believe, probably correctly, that they won’t measure up. All of these pressures underscore the battles ahead for President Trump and the conservatives in Congress who will be fighting the war to reform the government. Realistically speaking, this movement will take years to advance and requires a great amount of time and resources to “educate” the public on the benefits of change. York is right – Trump has been an executive success. As for the congressional portion of his campaign platform, all he needs to fulfill it is make sure the issues are kept in the public sphere where Americans can weigh-in with their votes. The rest is up to the legislative branch. It certainly hasn’t received much acknowledgement from the press but another major Trump administration accomplishment thus far has been appointing stellar principled people to head federal departments. As alluded to in the last section, Betsy DeVos has turned out to be an excellent advocate for school choice and changing peoples’ attitudes about education. Similarly, Secretary of State Rex Tillerson has earned praise from many circles for his common sense approach to foreign affairs. And Attorney General Jeff Sessions has become perhaps the star of them all with his simple insistence on good old fashioned law enforcement. After eight years in hiatus -- under Sessions, the law is back in vogue. One sure way to tell is the volume of protests heard from liberals concerning just about everything Sessions does or says. Last week they hooted over Sessions’ off-the-cuff remark about a Hawaii judge’s order staying Trump’s legitimate constitutional executive power as commander in chief. This week it’s Senate Minority Leader Chuck Schumer objecting to Sessions’ threat to pull funding from sanctuary cities. Schumer’s right. The establishment elitist New York Times is largely biased liberal garbage and doesn’t compare in credibility to Breitbart. In fact, as strange as it is to admit, I agree with most of what Schumer uttered, though I think he was pointing to himself as the problem rather than anything Sessions said or did. Sessions apparently walked back the “soft on crime” part of the sanctuary cities news release, though it certainly can be argued New York’s sanctuary policy makes its streets more dangerous. In the same interview Schumer babbled on about how his daughters ride the subway at 4 o’clock in the morning and this fact alone supposedly makes New York City a safe place to be. Schumer should tell that to the multitudes of parents across the country whose children have been the victims of illegal alien criminals who shouldn’t even be in this country. What about the “angel moms” who finally have the ear of an administration that cares about law enforcement, police officers and the letter of the law? It’s strange how Schumer talks about “fact based” conclusions because he himself is one of the biggest truth-benders in Congress – and that’s saying a lot. Perhaps he’s already forgotten about his appearance before the press shedding crocodile tears over the cruelty of President Trump’s legitimate executive order to temporarily ban travel from war-torn hotspots in the world. That’s not to mention the complete fool Schumer made of himself during Justice Neil Gorsuch’s confirmation hearings. Schumer was a running joke while unsuccessfully arguing to retain the filibuster for Supreme Court nominations, all the while insisting Mitch McConnell and the Republicans were making a grave mistake by “nuking” the senate rules. Schumer (in 2013) is on video making the very same case he was arguing against earlier this month. Heck, Schumer started the whole hubbub over filibustering Supreme Court nominees back in 2006 when he tried to stop the confirmation of Justice Samuel Alito. As the de facto leader of the opposition party Schumer has a right to say pretty much whatever he wants, but it’s up to the people to believe or dismiss him. The Founding Fathers did indeed create a country where the government depends on the good faith and leadership of people like Jeff Sessions. If those great men had lived long enough to see the way Schumer is behaving today, the only “fact” they’d comprehend is how half of the country is now represented by people with sour political motives and ambitions. Since he can cry on cue, perhaps Schumer should take up a career in acting. Or maybe he could try basketball – he’s great at shooting air-balls. That’s one “fact” that’s not in dispute. The proposal got both sides jazzed up for a battle. For those who never believed Trump could win, they didn’t worry about it – his words were just rhetoric. For those who voted for him because of those words, they’re counting on him to keep his promise. 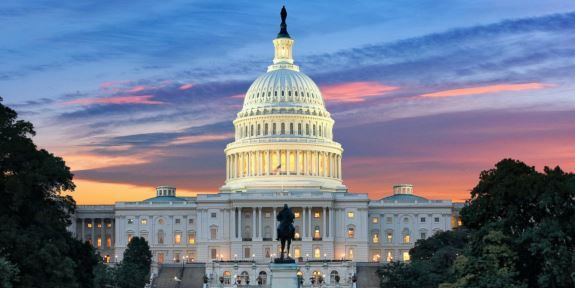 It all could come to a head this week as a potential government shutdown looms on the horizon. Rebecca Savransky of The Hill reports, “Trump and top administration officials on Sunday talked up the importance of the border wall. The government will shut down at midnight on April 28 if Congress cannot agree on a spending bill. In her article Savransky added Democrats are demanding that the spending bill contain funding to keep Obamacare’s cost sharing program alive. Democrats wouldn’t want Obama’s legacy achievement to die of natural causes so they’re hoping to keep it on life support a little longer – at least until the Republican establishment rides to their rescue. I’m sure the status quo-favoring Republican leadership would be more than happy to give Democrats precisely what they want out of this deal – money for Obamacare and not a cent for Trump’s border wall. It’s no secret the big business interests of the GOP don’t care about illegal immigration (as long as it provides them with cheap labor) and they’re similarly content to put up with Obamacare’s mandates because they don’t harm them like they do individuals and small businesses. This “wall” issue could mark a turning point in Trump’s young presidency. If the president gives in to the Democrats and the establishment over this matter it will set a precedent that will be hard to break for the balance of Trump’s presidency. While most people don’t put a lot of value into what’s done and left undone in a president’s first 100 days, it does mark the boundaries of what he’s willing to accept in terms of being pushed around by the opposition. Unfortunately Trump will need Republican congressional leaders to hold firm to ensure wall funds are included in whatever comes to his desk. It certainly looks like the Democrats may relent on the wall if Ryan and McConnell pack the bill full of Obamacare treats. That’s the way things are done in Washington. The political class wins and taxpayers lose -- again. But hopefully Trump will insist on including the wall in the bargain…then at least it won’t be a complete loss.